Download "Middle Georgia State College School of Education"
1 Early Childhood Special Education (B.S.) The Early Childhood Special Education program prepares the candidate to provide educational services for all students in grades P-5, including those with disabilities whose individualized Education Program (IEP) indicates instruction using the general education curriculum and participation in the general statewide assessment and special education preschool (Ages 3-5). The program is offered as full-time, part-time or non-certification tracks. ECSE Admission Requirements Admission into the Early Childhood Special Education Program is competitive and granted on a space available basis. Students must: 1. Be admitted to Middle Georgia State College in good academic standing. Disciplinary action at Middle Georgia State College and/or any other institution that the student has attended or while in the military may prevent admission. 2. Complete and submit program application to the secretary or administrative assistant. Applications are found on the website. Prospective students may also contact the School of Education for an application packet. Deadline for submission is May 15 th for fall semester, and October 15 th for spring semester. Applications submitted after the deadline will be considered after all applicants meeting the deadline are processed. 3. Present a passing score on the GACE Basic Skills Exam or show evidence of exemption from either of the following national exam scores: 525 composite score on Praxis I (if taken prior to August 2006); SAT - combined score of 1000 on SAT verbal/math; ACT combined score of 43 on English/Math; or GRE combined score of 1030 on verbal/quantitative. 4. Submit criminal background check. 5. 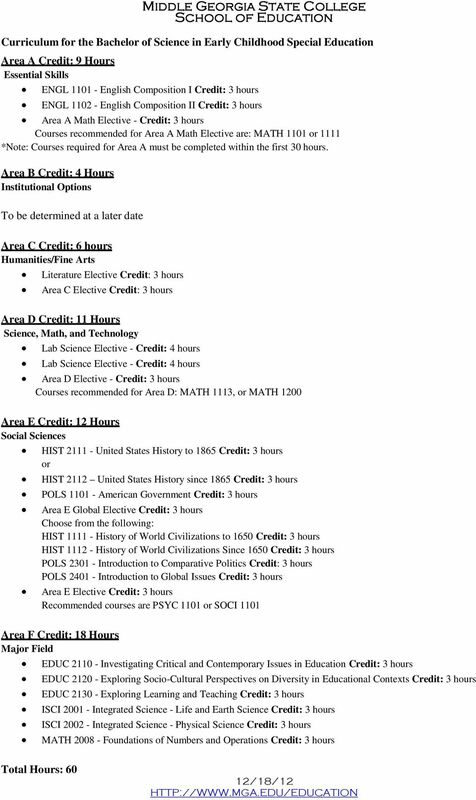 Complete the Core curriculum to include Area F (60 semester hours). 6. Earn a cumulative GPA of 2.75 or higher on all courses to include transfer, transient, or taken as a part of a prior degree. Students who have not met all requirements for admission but have a cumulative GPA between may submit a letter of appeal as part of their application. 7. Earn a grade of C or better in courses taken in Area A and Area F. 8. Pass Area F Field Experience Evaluation. 9. Provide three letters of professional recommendation to include one letter from a professor. If employed as a paraprofessional, submit the Principal Sponsorship Form. 10. Be available during regular public school day hours for internship, clinical experiences, and program-based seminars. 11. Transfer and part-time students may be eligible for admission without having satisfied the Middle Georgia State 12. College Area B requirement. Exceptions will be made at the discretion of the Dean of the. 13. Prospective candidates will be required to interview and write a sample essay as part of the interview process. 14. Applicants selected for admission will be notified in writing by the. Upon acceptance, students are referred to as teacher candidates. 15. Upon acceptance teacher candidates must present proof of having liability insurance and a Livetext account. 16. Teacher candidates must meet with their advisor as soon as is possible to finalize the program of study. Teacher candidates are required to follow the program of study as prepared by their advisor. Deviations from that program without prior consent from the Dean of the will result in dismissal from the School of Education. 17. 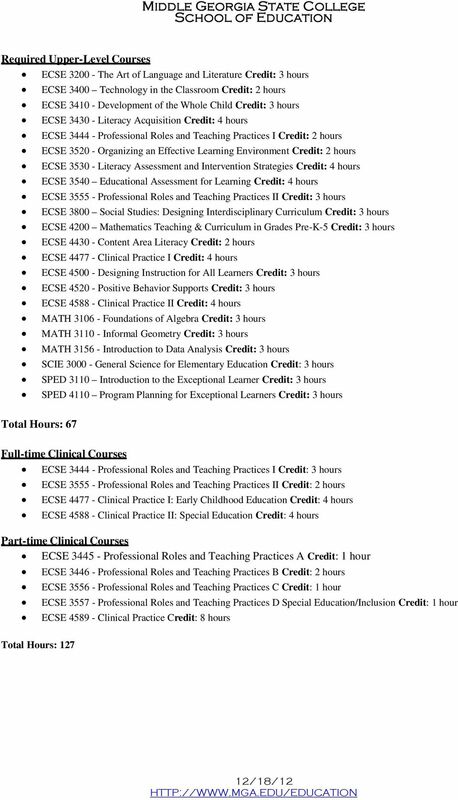 Teacher candidates must complete the education course sequence to which they were admitted. Students cannot transfer between campuses/programs. Deviations from that program without prior consent from the Dean of the will result in dismissal from the. 18. Teacher candidates admitted to the part-time or non-certification track are subject to academic policies and procedures that may not be outlined in this document. 2 ECSE Academic Progress and Completion Teacher candidates must meet the following requirements to remain in the ECSE program: 1. Maintain an overall cumulative GPA of 2.75 or greater in all courses in the major. Students may be placed on probation within the during their junior year of the ECSE program. Students must be in good academic standing and have a cumulative GPA of 2.75 to progress to their senior year of coursework. 2. Earn a grade no lower than a C in all upper division courses. 3. Retake only one upper level course where a grade of D or F was earned. Students will not be allowed to progress into subsequent courses. 4. Pass all key assessments with an 80% mastery. 5. Maintain professional liability insurance and a Livetext account for the duration of the program. 6. Provide evidence of attempting GACE Content Exam prior to progression into Clinical Practice II. (EDUC 4588 or 7. EDUC 4589) 8. 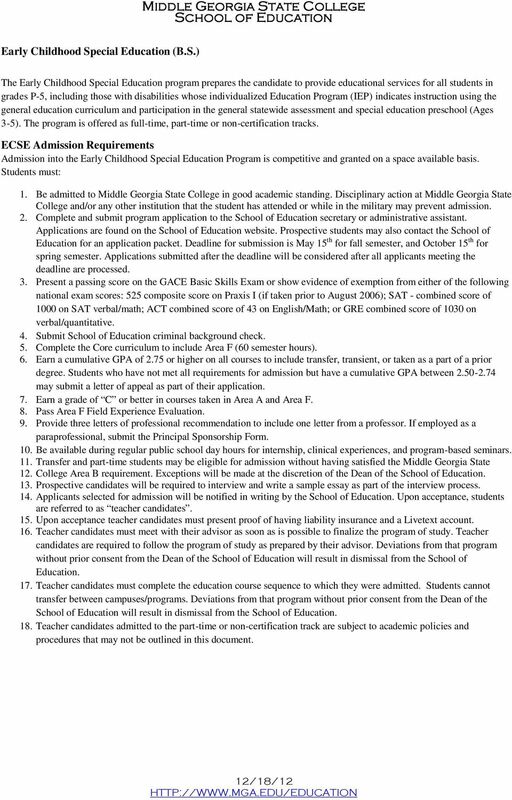 Complete residency requirements for Middle Georgia State College. 9. 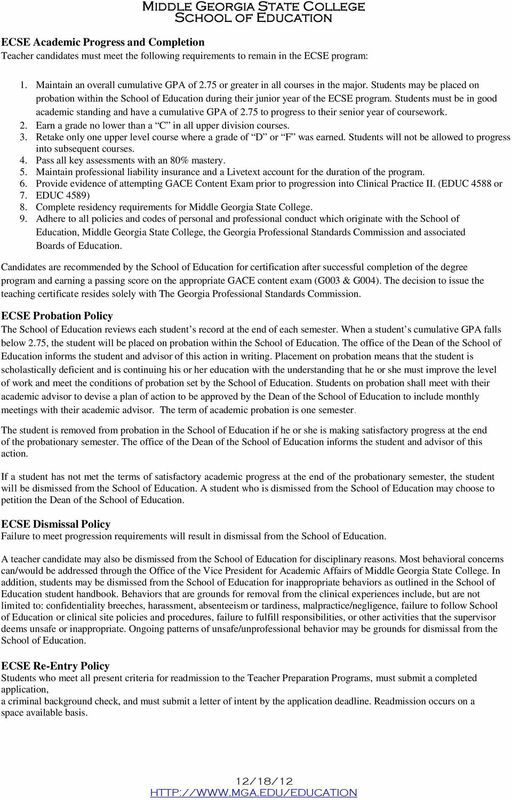 Adhere to all policies and codes of personal and professional conduct which originate with the School of Education, Middle Georgia State College, the Georgia Professional Standards Commission and associated Boards of Education. Candidates are recommended by the for certification after successful completion of the degree program and earning a passing score on the appropriate GACE content exam (G003 & G004). The decision to issue the teaching certificat e resides solely with The Georgia Professional Standards Commission. ECSE Probation Policy The reviews each student s record at the end of each semester. When a student s cumulative GPA falls below 2.75, the student will be placed on probation within the. The office of the Dean of the School of Education informs the student and advisor of this action in writing. Placement on probation means that the student is scholastically deficient and is continuing his or her education with the understanding that he or she must improve the level of work and meet the conditions of probation set by the. Students on probation shall meet with their academic advisor to devise a plan of action to be approved by the Dean of the to include monthly meetings with their academic advisor. The term of academic probation is one semester. The student is removed from probation in the if he or she is making satisfactory progress at the end of the probationary semester. The office of the Dean of the informs the student and advisor of this action. If a student has not met the terms of satisfactory academic progress at the end of the probationary semester, the student will be dismissed from the. A student who is dismissed from the may choose to petition the Dean of the. ECSE Dismissal Policy Failure to meet progression requirements will result in dismissal from the. A teacher candidate may also be dismissed from the for disciplinary reasons. Most behavioral concerns can/would be addressed through the Office of the Vice President for Academic Affairs of Middle Georgia State College. In addition, students may be dismissed from the for inappropriate behaviors as outlined in the School of Education student handbook. Behaviors that are grounds for removal from the clinical experiences include, but are not limited to: confidentiality breeches, harassment, absenteeism or tardiness, malpractice/negligence, failure to follow School of Education or clinical site policies and procedures, failure to fulfill responsibilities, or other activities that the supervisor deems unsafe or inappropriate. Ongoing patterns of unsafe/unprofessional behavior may be grounds for dismissal from the. ECSE Re-Entry Policy Students who meet all present criteria for readmission to the Teacher Preparation Programs, must submit a completed application, a criminal background check, and must submit a letter of intent by the application deadline. Readmission occurs on a space available basis. 62 School of Education, Leadership Studies, and Counseling Lynchburg College SCHOOL OF EDUCATION, LEADERSHIP STUDIES, AND COUNSELING School Dean: Dr. Roger E. Jones Department Faculty: Dr. Barnhill, Dr.
International Education Department Teaching English to Speakers of Other Languages (TESOL) Program Policies APPROVAL: 1. Program Revision: January 2006 2. Admissions & Standards Committee: March 2006 3. HEALTH CARE ADMINISTRATION AND PLANNING ACADEMIC MAP: DEGREE BS (120 CREDIT HOURS) This degree map is a semester-by-semester course schedule for students majoring in Health Care Administration and Planning.